Cognitive Distortions is just another term for “Thought Errors” or “Thinking Errors”. A common strategy for a client of Cognitive Behavioral Therapy, for mood disorder (including depression), anxiety disorder and emotional management, is to: “Catch”, and then “Correct” Cognitive Distortions, aka “Thinking Errors” or ” Thought errors”, before they trigger more intrusive thoughts, moods or actions. Thought Errors are usually described as thought in symbols and verbal language, that are irrational and self-defeating, and that lead to intrusions in ones life. Because clients seeking Cognitive Behavioral Therapy (C.B.T.) are often hypersensitive to judgment and self-judgement , cognitive distortion maybe the preferred wordage to Errors. The jargon is descriptive rather than definitive of processes, with the purpose of overall treatment. This is “catastrophizing“. Thinking of the worst possible outcome of an event, (while all the time denying, ignoring or minimizing other potential outcomes.) Very common.. everybody catastrophizes sometimes. However if this thought becomes chronic , repetitive , intrusive, or if it triggers other intrusive cognitions and actions, or complicates illnesses then considering therapies is not a bad idea. “Catching” Cognitive Errors can be tricky: One learns to be mindful of them when they happen. this takes time. From the phenomenological perspective of Gestalt Therapy, these strands of symbols and verbal language, spoken or subvocalized (thought) are experienced with intense emotions (excitement) as they form as figures out of the consciousness ground of the present moment. A client can learn to further explore and understand hidden tenants and semantics, such as thoughts, attitudes or physiological reactions in the “field” when cognitive distortions form. — this is generally more of a Gestalt Therapy approach, but could be applied in other Therapies. Good Strategies for preparing for “Catch and Correct” use repetition. working through CBT Workbooks, Journaling , and writing / memorizing plans can be useful. Emotional reasoning – rationalizing a fact out of feeling. Catastrophizing – concluding the worst possible outcome of a potential situation, no matter how likey the possibility. There are many possibilities why my son is late. He could be held up in traffic, which is more likely”. Personalizing. self – judgment : Blaming one self for something that isn’t their fault. I am responsible for myself, and can only control so many things. Black / White Rigid Thinking – One divides everything into good and bad, right or wrong, all or nothing. Everyone and Every situation(including jobs) has qualities and difficulties. Thinking A place or person job or situation, will be entirely perfect or entirely dismal will lead to disappointment. Should statements: self -judgment and top dogging oneself. Although its important to wish, and to hope: Saying what I should be doing is self judging, and takes me away from who I am and can lead to resentments. Over-Labeling: Applying an adjective or a descriptive trait of someone or something and assuming it is the whole of it. Someone may be conservative or liberal, etc, or have some values as such. But believing that some traits make the whole of something may lead me to the wrong overall conclusions or prejudgments. Magnifying– 1.blowing out of proportion your error, or another persons success 2 overstating a the importance of a situation. ” i didn’t get hired job after my bad interview. this is a sign I will NEVER get a job. Accidents happen, bad performances happen in Interviews. That doesn’t reflect on All my driving or actions. Leaping (to conclusions) – assuming the outcomes of events without evidence or information. Mind reading – assuming what another person is thinking or feeling, without asking. Minimizing – 1. denying ones own success and qualities. 2 denying the consequences of an action. Read More on Thinking errors here. If you listen carefully as you read this post, you will notice a faintly audible whisper of the the words you are reading. It may be the same whisper you use to think in the symbols and code of language. It maybe an on going monologue or diaogue one has with his or herself, or narrative of scenes played out inside ones head. This overall process is dubbed “inner speech“, “inner monologue“, “inner dialogue” or Subvocalization, depending on what you read. Subvocalization is term usually used in the context of reading. However, because of the active verb subvocalizing, or to subvocalize, I prefer to use it here. To subvocalize is more specific than to think, as one can “visualize” , “Be mindful“, feel, or even speed read while thinking without that low audible whisper of language. 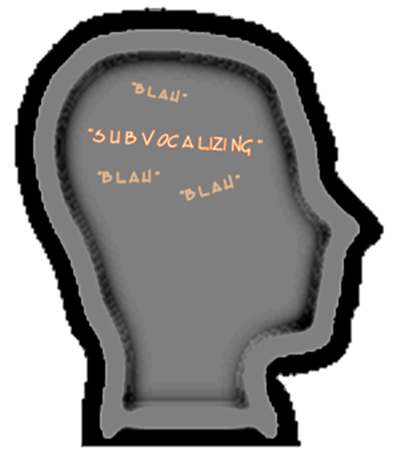 Subvocalization is thinking in Language, the way one would hear or speak it. The following are a few difficulties with subvocal thinking. This is my speculation based upon my experience. I am not a doctor. If your thinking is causing you serious health or life problems consult a doctor or health care professional. One suggestion in neuroscience is that one side of ones brain creates emotional responses while the other side of ones brain uses the inner dialogue to rationalize the emotion. Perhaps Affects (mood and emotion) influence on the process of subvocalizing is what produces “cognitive distortions” or “Thinking Errors” aka “Thought Errors“). These “errors” maybe life- intrusive and/or self defeating, and are particular problem for people with Mental disorders (like me), and require a person to cope, and pay special attention to their inner dialogue. People who suffer from long term Depression , for example will usually “hear” a excessive negative or self defeating subvocal thinking. For some people, especially diagnosed with mental disorders, subvocalizing can seem “louder” than sensory intake . For me in the past, my attention span was consumed by inner thoughts, as if my thinking was so loud, that I had trouble keeping my attention span on the outside world. I have described this as being unable to focus, feeling lost in thought. very frustrating. For Some with mood disorders, when their mood is elevated their subvocalization seems faster than normal. Faster than normal subvocalization is usually called as “racing thoughts”. For those people experiencing “racing thoughts” , they may have a sense of higher creativity or productivity, real or false. Consequentially the speedy subvocalizing leads to fatigue and unstable moods, irrational thinking, or worse: the delusional thinking of psychosis . Sometimes subvocalization can seem hostile to the person experiencing them: such as the case with “intrusive thinking”. Some people can be overwhelmed with the very intrusive Thoughts of self harm, or harming others, that are repeatedly subvocalized … “round and round in ones head”. Ironically the subject matter of this inner monologue or narrative is NOT the intent of the person — instead it is very scary experience! Intrusive thoughts are unwanted. Intrusive thoughts are not delusions. Instead they are pressing, unwanted unreasonable thoughts and fears that are repetitious. After time they can develop into obsessions. Intrusive thoughts are consciously rejected and uncomfortable, but extremely hard to get rid of for some people. An example: A women suffering from “intrusive thinking” (perhaps symtoms associated with postpardom OCD, in this example), could have the constant thought (subvocalization) of harming her child. But it is not the true intension of the mother, usually its the opposite: the scariness thing her mind could conjure. Instead the repeating thought terrifies the young mother. Doctors and professionals associated Intrusive thinking with Obsessive Compulsive Disorder, Anxiety Disorder and ADHD, but they can be a symptom with other diagnosis. Its a possibility that, in the case of someone experiencing intrusive thinking, that this particular inner thought pattern is a behavior that is doing something else for the body: perhaps drumming up Alert/anxiety centers for the body to be in a state of readiness. Being in a state of readiness and alertness may have helped early humans survive in their evolution. who knows… this notion is hard to prove. In any case, the problem is that in today’s world this thought pattern is scary and unwanted. Often people suffering with intrusive thinking willh believe they are evil or bad.. not realizing that,this is a process of the mind, somehow drumming up their most fearful thoughts…possibly to protect themselves. Ironic. Noting the problems with an unhealthy subvocalizing process , I think it is important to disambiguate subvocalizing from the generic term “thinking” for the purpose of this conversation. Subvocalization uses language while other cognitive process do not. I am able to cognate (interpret, process and feel emotion) without relying on subvocalization all the time. I am able to be mindful ( filling ones attention span) of mental formations other than subvocalizing with language, by just observing, visualizing or meditating. I am able to “quiet” subvocalization especially with meditation or medication. subvocalizing appears to be, in my phenomenological experience, to be an activity such as walking or talking. subvocalizing is not the whole of my thinking, and it does not have to control the whole me or my thinking. When Someone says I am not my thoughts… this is what they are talking about: the chattering and for some consuming “subvocalization” process or inner speech. Subvocalization is part of me, part of my cognation or thinking processes, but not the whole of me. The process is very useful in daily life, but comes with consequences. — As with “Loud Subvocalization” ” Racing thoughts”, “Thinking Errors”, and “Intrusive thinking” The inner dialogue and subvocalizing can as destructive as they are anything else . Learning to understand and control the inner dialogue may be important in managing Mental Wellness. If one is experiencing what he or she thinks are Intrusive thoughts, Thinking errors, Depression Mania, or any uncomfortable problems with your thinking — Its more than a good idea to Talk to your doctor or health-care provider. Doctors are able to prescribe treatment or medication that can help one manage health problems quickly — Yes these are real health problems.– Doctors and professionals are the only ones who diagnose a person with a disorder if needed. Breathing Exercises and Meditation are excellent ways to learn to let go of subvocalization and be more mindful of other things. A breathing and/or counting exercise can be a good plan to slow down or control an episode of negative, intrusive, or obsessive thoughts when an episode arises. Positive Self Talk. When becoming aware of of a negative, intrusive or racing train of thought: verbalize “STOP!” or “I AM SAFE”, followed by verbalizing positive affirmations. learning to replace negative thoughts with positive ones take time, but is helpful. Journaling – writing has been a way for to let go of thoughts that seem to go round in my head. I am not sure why it is helpful. perhaps the physical act of writing what is on my mind expels the energy of it all. Or perhaps it gives me a way to clarify my thoughts. As far I can tell, our inner speech or subvocalization is not such a bad thing, much of the time, nor should it be. Our use of language, thinking in language and speech helps us read, clarify our ideas, explore ideas more deeply, use rational problem solving, and communicate with other people. But it is important to realize that it is not the whole of my thinking, or the whole of me. And for those of us who suffer with excessive, negative, or intrusive subvocalizing, better understanding these process can make us happier and allow are thinking to be more useful tool and component for the whole of ourselves. “Thought Errors” definition: irrational and self defeating thoughts that lead one to feel bad or that lead to intrusions in ones life. “Thought Errors”,aka “Thinking Errors“, “cognitive distortions”… from a Cognitive-Behavior Therapy (or C.B.T) point of view, are not meant to be a judgment of ones intelligence. Rather they are intrusive behavior-like forms of thought to be aware of ,and from the the C.B.T. View point, to be worked through rationally. For people who manage disorders, Such as Bipolar Disorder, Major Depression and Anxiety Disorders: “thought errors” can build and snowball into more harmful or intrusive thoughts, feelings or behaviors, so learning to catch them (and eventually correct them) is a useful tool in staying well. Personally I prefer the Gestalt therapy way of managing my mental wellness, (holistic awareness of mind/body/behavior and processes ), However every Mental Wellness manager is different. Plus, the awareness of ; and working through of ….Thought Errors is a useful tool of any management. Magnifying– 1.blowing out of proportion your error, or another persons success 2 overstating a situation. Thought Errors (aka cognitive distortions) are difficult to “catch” or be mindful of, at first. They are common to everyone, can be long standing thought behaviors and often come with a lot of emotion connect to them. Catching them, or being mindful of them, can be improved by journaling, Mental Health Work books, or asking a therapist to help design plans. Catastrophizing—expecting or concluding only the worst possible outcome. We often catastophize are circumstances present, past and future. Bad Things are usually never as terrible as they seem. Our defenses often overplay and distort circumstances that scare us. posted by alefernandeschaves at youtube. *Catastrophizing is a form of thinking where one leaps to the worsed possible out come.. The first step in reducing catastrophic thinking is awareness. writing thoughts down in journals. working through this kind of thinking error takes time. One way is to right down the possible out comes. He was in a accident. He is stuck in traffic. which is more likely? This is a rational approach. Also we must find ways to express our emotions about the possible outcomes. create a dialog between the our thoughts and feelings. The more aware we are of our thinking process :the more we are able to control the useful tool..
….and integrate it peacefully with the rest of our being.